Home Tags Posts tagged with "lake trout"
Labor Day this year was off to a bad start, the over-dramatized arrival of Hurricane Hermine forcing us to change our long-standing vacation plans at the last minute from a lazy weekend at a Maryland beach to something further inland, like Cayuga Lake in Western New York. The inconvenience proved to be worth it, though. Firstly, the weather was beautiful up there. Then, while Maryland isn’t known for its wine (only its one wine critic), the Finger Lakes are, and I got to try McGregor Vineyard‘s wines made of Eastern European Saperavi, Sereksiya, and Rkatsiteli varietals. And lastly, I went fishing with Captain John. I’ve been fishing with John for years now — in fact, he guided me on my first-ever fishing trip. This time, we launched from Long Point State Park on the eastern shore of Cayuga Lake, very close to Ithaca. We focused on lake trout all day, and we had some good action: six fish landed, running from 23″ to 29″, and a few sunburned pictures to prove it. Four of those (fish, not pictures) went home with me, so it’s time to get cooking! 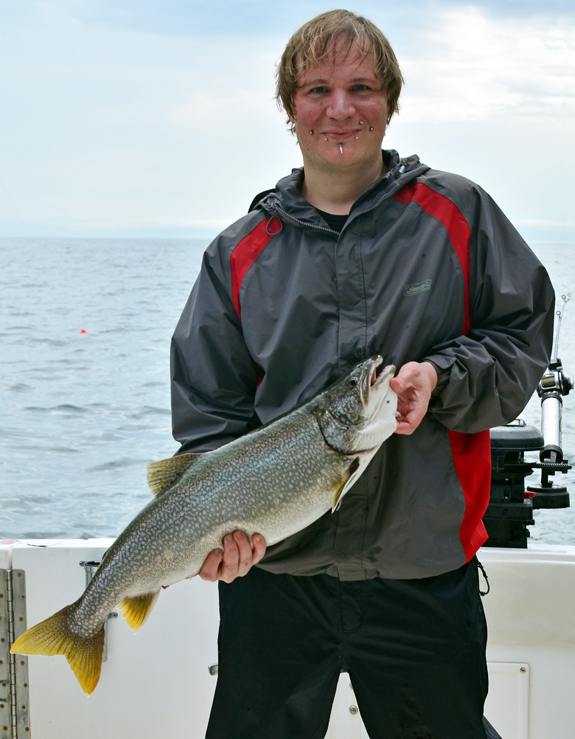 This gave me an excuse to redo some of my existing lake trout recipes, and take better pictures for my Throwback Thursdays on Facebook. 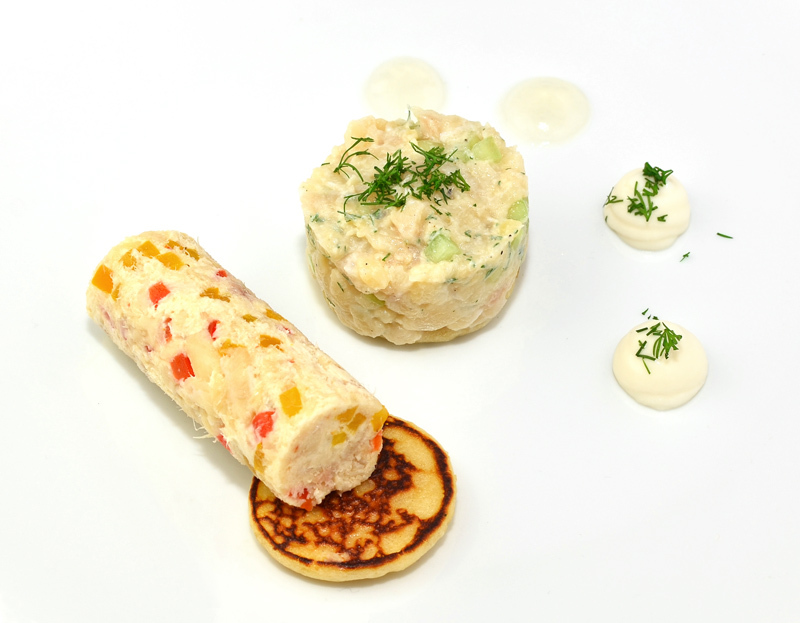 You can admire some of the results by revisiting the Salmon Coulibiac, Cured Lake Trout Roe, and Vodka-Cured Lake Trout. In fact, I ended up with so much trout roe that I had to look for other ways to prepare it, and I’ve started working on a bottarga recipe (which, unfortunately, requires more work). The recipe is almost shockingly simple. No siphon required, for once. It calls for a piping bag to top the croutons with whipped ricotta (which by the way could be reformulated to include tvorog), but they’ll taste just as good if you use a teaspoon. And if you’ve read Kenji López-Alt‘s The Food Lab, egg poaching will hold no secret for you. As much as I’d love for you to try my trout recipes, you can substitute with store-bought equivalents just this once, replacing the vodka-cured trout with smoked salmon, the trout roe with salmon roe, and the trout-bottarga-whose-recipe-I-haven’t-published-yet with “regular” bottarga of grey mullet or bluefin tuna. In a pot over medium heat, sauté the celery and onion in the olive oil until soft. Add the potatoes, season with salt and pepper, then cook until very slightly colored, stirring regularly. Add the stock and water, cover, and simmer for 12-15 minutes, until the potatoes are fully cooked. Transfer to a blender, and process until smooth. Heat the milk to 70 C / 160 F, then whisk in the potato mixture. Rectify the seasoning, and reserve. Place the bread slices on a sheet tray lined with parchment paper. Drizzle both sides with the olive oil. Toast in a 200 C / 400 F oven for about 4 minutes per side, until golden brown. Reserve. In the bowl of an electric mixer fit with the paddle attachment, mix the cream cheese, ricotta, and milk on medium speed. Scrape down the sides, then add the lemon juice and salt, and mix again. Scrape down the sides and mix once more. Transfer the mixture to a piping bag fit with a decorating tip. Bring a large saucepan of water mixed with 1% salt to a boil, then reduce the heat to the lowest setting. Proceeding one egg at a time, break each egg into a cup, then tip into a strainer and allow the excess white to drain. Lower the strainer into the saucepan, and tilt the egg out into the water. Cook for 3 1/2 minutes, gently stirring the water with a spatula every once in a while. Take the eggs out with a skimmer, and reserve in a bowl filled with hot water. Reheat the potato cream soup, adding a little bit of milk if it seems too thick. Pipe some whipped ricotta onto each crouton. Top 1/3 of them with lake trout roe, 1/3 with cured lake trout, and 1/3 with lake trout bottarga grated with a Microplane grater. Divide the potato cream soup between bowls. In the center of each bowl, place a poached egg, surrounded by 6 assorted croutons. Season the egg with black pepper. Drizzle the soup with olive oil, and sprinkle with chives. Serve immediately. True story: A couple weekends ago, I went fishing in rural Moravia. I caught a trout, picked up a bottle of Riesling from a nearby vineyard, came up with this recipe, inspired by local specialties, and got back home on Sunday night. 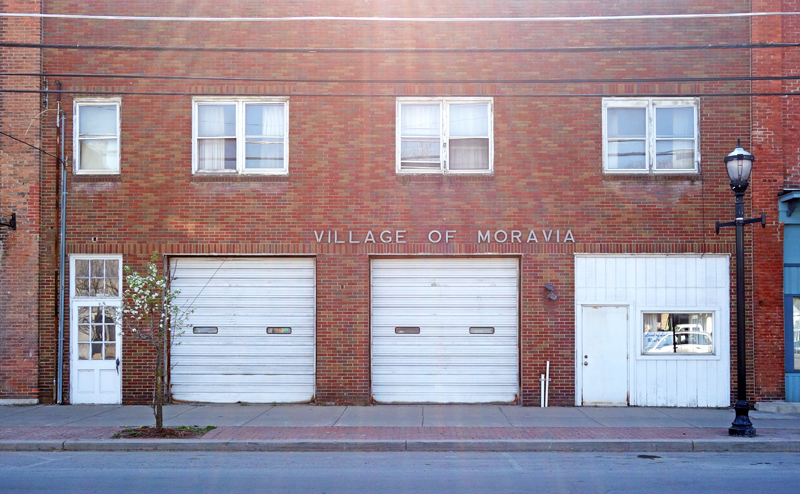 Still, no jet lag, and no need to break the bank — I wasn’t in the Moravian region of the Czech Republic. 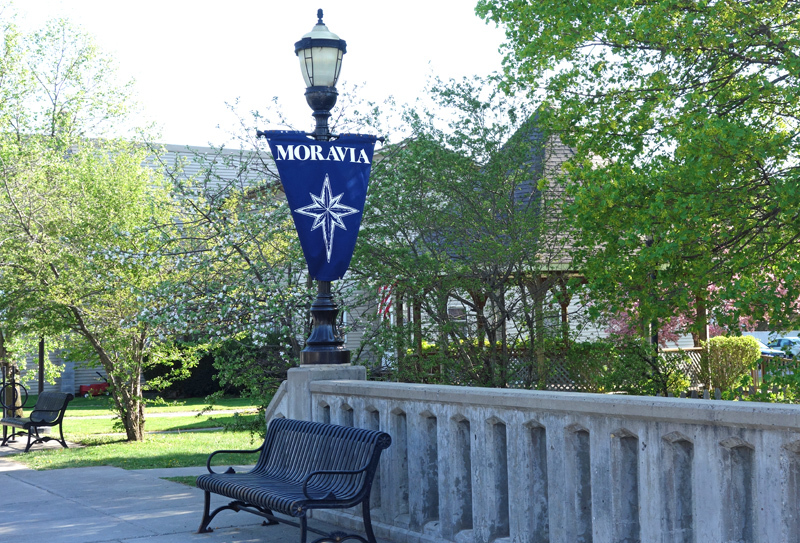 The Moravia I’m talking about is in Upstate New York, at the southern tip of Owasco Lake. My recipe may not be revolutionary, but it brings us a bit closer to the present decade. I kept the traditional Czech flavors of the original: trout, dill, cucumber, peppers. But I use two to three times as much trout. 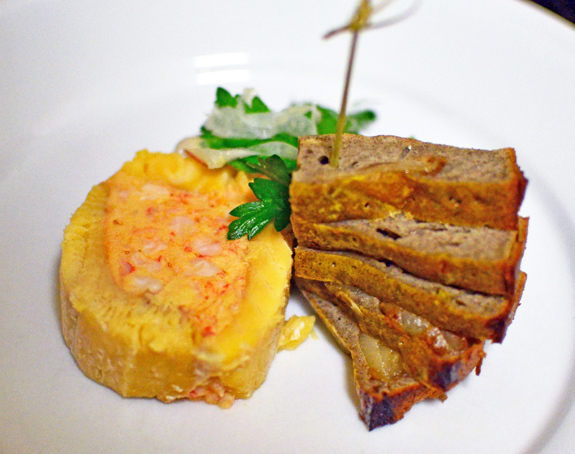 The terrine is replaced with rillettes, still smoked, and the “gnocchi” is now a bona fide tartare of raw trout. I know I’ve already posted recipes for trout rillettes (here) and tartare (here), but today’s versions are different — and better-looking! The original watercress sauce, used to dot the plate, is nixed in favor of a couple of fluid gels inspired by the ones found in Heston Blumenthal’s Historic Heston. One is an onion gel, and the second is a Riesling gel. To make them, you’ll need gellan F, which you can buy from Modernist Pantry. The proportions for both gels make way over 4 servings, but it’s hard to scale them down, so you’ll just have to decorate all your dinner plates with pretty onion and Riesling dots for a week. As for the choice of wine, a semi-dry Riesling that I purchased at Domaine Lesseure, a few Finger Lakes over from Owasco, is perfect for the job. Winemaker Sébastien Leseurre, who advocates natural fermentation, explained to me that the main difference between his dry and semi-dry Rieslings is that the semi-dry is left on the vines for 5 days longer. This, I believe, makes it quite similar to the late harvest (pozdní sběr) Rieslings found in Czech Republic, which are not really late harvest in the commonly understood “dessert wine” sense, but just a bit sweeter than dry table wine. Because life is already sweet enough in Moravia. In a saucepan over medium heat, bring the sugar and 200 g of the Riesling to 95 C / 200 F, stirring regularly, and simmer at that temperature for about 30 seconds. Transfer to a blender. While blending on low speed, add the gellan, then process on medium speed for 1 minute. Transfer to a plastic container, and let cool in a bath of ice water until the mixture has solidified and cooled completely. Return to the blender, and add the remaining Riesling and the lemon juice. Blend for 1 minute on medium speed, stopping to scrape the sides of the jar once or twice. Transfer the gel to a squeeze bottle, and refrigerate. In a saucepan over medium heat, sweat the onions in the butter until soft. Add 100 g of the milk, then the heavy cream, chicken stock, and salt, and simmer for 5 minutes. Partially blitz the onion mixture with a hand blender, and pass through a chinois. Weigh 200 g of the mixture, return to the saucepan, and bring to 95 C / 200 F.
Return to the blender, and add the remaining milk. Blend for 1 minute on medium speed, stopping to scrape the sides of the jar once or twice. Cut the cucumber into a brunoise, and let rest on paper towels for 10 minutes. Cut the trout into a brunoise, and transfer to a bowl together with the cucumber. Add the crème fraîche, onion fluid gel, lemon juice, dill, salt, and pepper, and mix with a spatula. Cover and refrigerate. Char the peppers on a gas stovetop or using a blow torch. Then peel, seed, and cut into a brunoise. Measure 120 g, and keep the rest for another recipe. Place the pepper brunoise with the Riesling into a small saucepan, simmer over medium heat for a couple minutes, then cover and cook until soft. Let cool, and reserve. Spread the olive oil on the trout fillets, then place into a sous-vide pouch, vacuum-seal, and cook in a 120 F water bath for 30 minutes. Remove the trout from the pouch, and pat dry with paper towels. Combine the smoked salt, curing salt, and piment d’espelette, and season the fish evenly. Let cool. Place the butter in an electric mixer fit with the paddle attachment, and beat at maximum speed for about 5 minutes. Add about 1/4 of the trout mixture, and beat until smooth. Add the pepper and wine mixture, and beat until incorporated. Flake the rest of the trout between your fingers, add to the mixer, and beat at low speed for a few seconds, until evenly distributed but still chunky. Proceeding in batches, place the rillettes onto sheets of plastic film, and shape into 3.5 cm diameter cylinders. Wrap very tightly, then refrigerate. If the rillettes are too soft to be shaped into cylinders, chill them in the fridge for a few hours first. 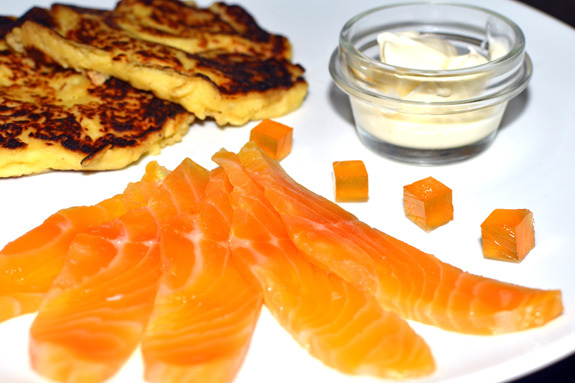 If you want to make the mini blini yourself, use the yeast-free blini/oladi recipe here. In a non-stick pan over medium heat, sauté the mini blini in butter until crispy, proceeding in batches if necessary. Reserve. Refrigerate the plates for a few minutes. On each plate, squeeze two dots of Riesling gel and two dots of onion gel, parallel to the rim. 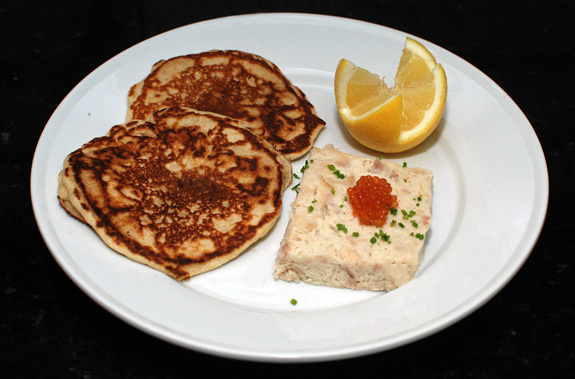 Place two mini blini near the center. Using a 5.5 cm diameter ring mold, mount the tartare on top of one of the blini. 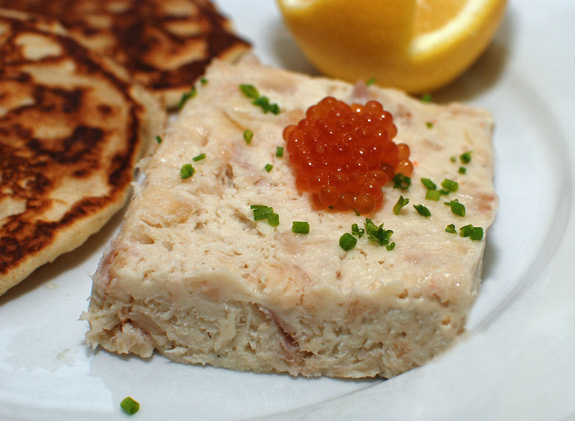 Place a log of rillettes on the other blini. Sprinkle some dill on top of the tartare and the onion gel, and serve immediately. 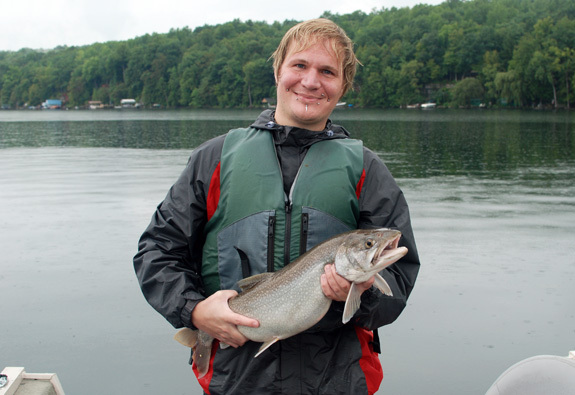 A few months back, I reported my giant catch of delicious, bright-orange-fleshed lake trout from Lake Ontario. Although I usually avoid freezing fish, that time I had no choice. This gave me plenty of trout to use, to try and perfect this ballotine recipe. Unlike the vodka cure, Hungarian Tokaji wine brings some subtle fruity notes to the fish. I’m not using just any Tokaji table wine, but an Aszú 4 puttonyos to get the right amount of sugar. However, I highly doubt that anyone would taste the result and exclaim, “Wow, this trout really tastes like Tokaji!” So to make this more than a gimmick, I serve it with small cubes of Tokaji jelly — and wow, these cubes really taste like Tokaji! It’s not easy, preparing elaborate recipes with fish you catch yourself. Sometimes, you come home empty-handed and anything you’ve thought of making has to wait until next time — this has happened a lot to me recently. But at other times, you land 40 lb of fish, and then you have to act fast — like two weeks ago, after a day on Lake Ontario with Captain Troy. We went back to the Finger Lakes last weekend, and spent a day fishing with Fisherman John on Cayuga Lake. It rained most of the day, but the catch ended up being pretty good. 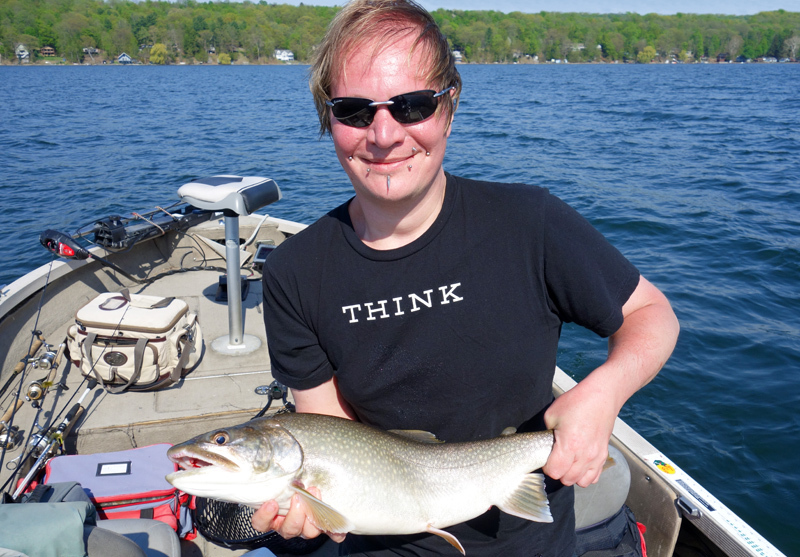 We caught a few bass, and during a brief sunny spell we managed to catch five lake trout in short succession, the biggest 28″ long, just under 7 lb. Since this is becoming a favorite category, I am starting a recipe page dedicated to trout, char and salmon.